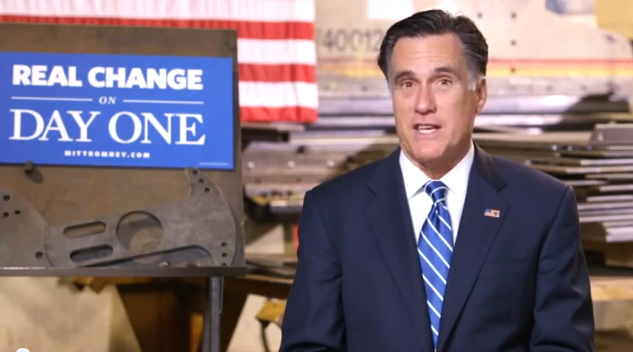 Romney urges Americans to vote for "change"
Mitt Romney is making his final push for support on Election Day, promising voters "change" and a "new path" in this week's Republican weekly address. Romney, who is spending the weekend campaigning in New Hampshire, Iowa and Colorado, blasted President Obama even while echoing the president's 2008 message. "In just a few short days, Americans will go to the polls and cast their ballots. Many of us are thinking about Election Day - this Tuesday, November 6th," Romney said. "But we should also spend some time thinking about November 7th. That's the day we'll know whether we made the right choice. Whether we settled for more of the same disappointment and decline ... or whether we took the first step down a new path that will deliver a real recovery and real change. " Mr. Obama, Romney argued, "promised so very much" but has "fallen so very short" of those goals. Obama at FEMA: "We still have a long way to go"
"We need a real turnaround if we are going to get our economy growing and get Americans working again. And I've led that kind of effort many times before," he said, referring to his experience in the private sector. The former Massachusetts governor, who has taken a softer tone in some of his recent appearances, pledged to work with both parties starting on "Day One" - the same day he promised to "send five bills to Congress and sign five executive orders." "Every one of them will help us create jobs - and that's just the start of my plan to create 12 million jobs in my first term alone," he said. In his five-point plan for achieving those goals, he cited achieving "North American energy independence by the year 2020"; making "sure our students and workers have the skills they need to succeed"; promoting American trade and cracking down on China; cutting the deficit and balancing the budget, and championing small businesses. "Look, I know we face big challenges, and we don't need more catchphrases or word games. We don't need more of the same petty partisan attacks. We need a leader, a leader with a real plan that will deliver real results," he said. "The choice before you is clear: We can wait four more years for real change ... or we can take things in a new direction in just a few short days."